I do the same, but with powdered chalk, after brushing some rail or boxcar brown on the rails. 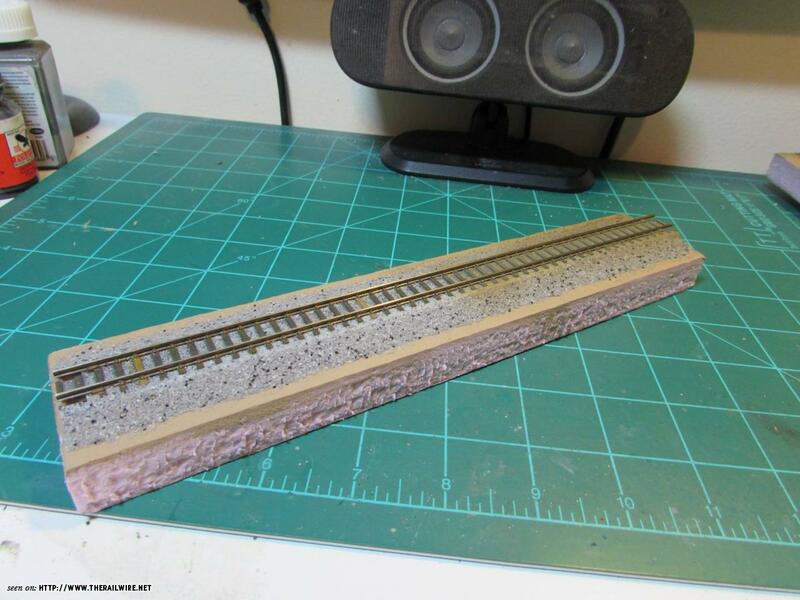 However, here are examples on the props I built for my "Ballast 101" clinic. The basic frame has been built, and Unitrack has been installed. As you can see, I went with a double module. The plan is to build two road crossings near each end and then model the street that is on each side of the track between the road crossings. Small, but I think I can get the effect by modeling a city block of buildings on about two thirds of the module and Ashland’s passenger station on the remaining one-third. 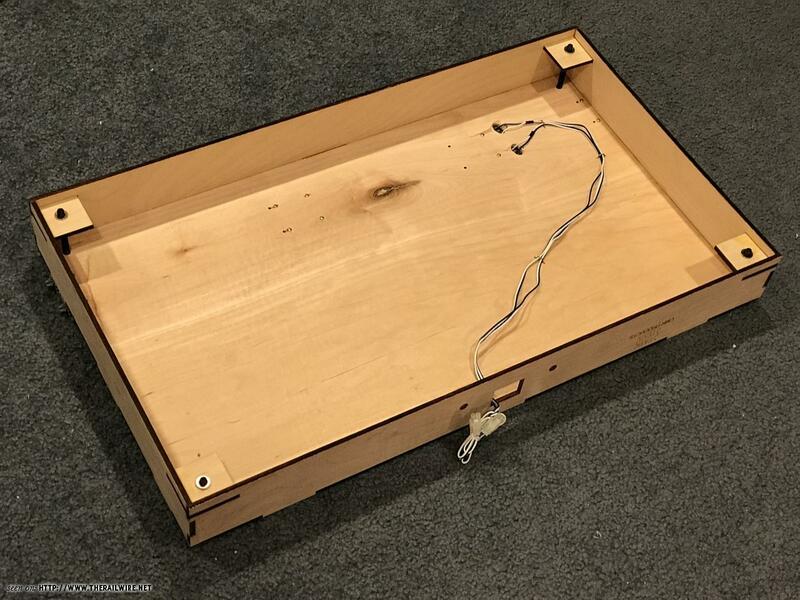 Here’s the underside showing the wiring and the leveling legs. The four holes in the top at each corner allow the legs to be adjusted from the top with an Allen wrench. The holes would have to be left exposed on top to do that, and I’m not sure whether I want to do that. As far as the basic construction, this module is complete and ready for use. It’s just about scenery and finishing work now. I’m pleased with the ruggedness of the frame. It’s solid and should be durable. If you look close at the picture of the underside, you’ll notice the heads of twelve screws that I used to secure the track. It’s not going to come loose with usage. The plan is to build two road crossings near each end and then model the street that is on each side of the track between the road crossings. Small, but I think I can get the effect by modeling a city block of buildings on about two thirds of the module and Ashland’s passenger station on the remaining one-third. Is the part of Ashland you plan to model essentially that which can be seen on the 'Ashland North' rail cam? 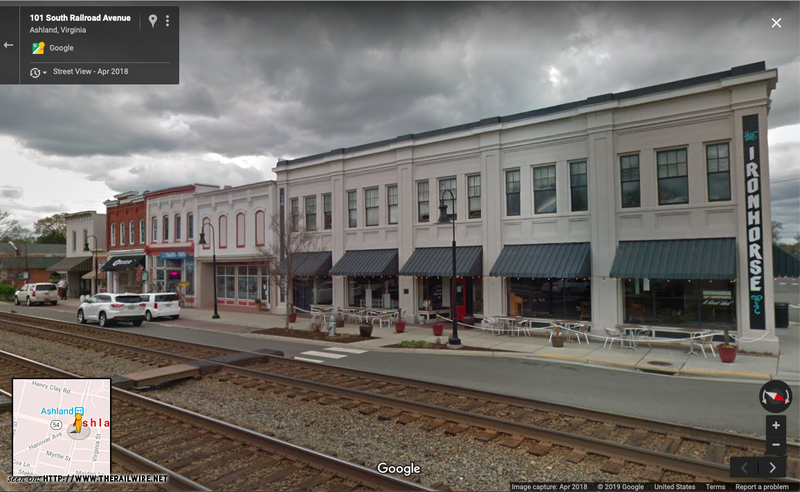 While that is a perfect little snippet out of Ashland (and includes the station), I was thinking either that or skip a block or two south and use this stretch (along with the station), which might be a little more photogenic. I haven't decided yet. Thoughts? Just my two cents, but I'd be inclined to include only the main grade crossing (Rt. 54/England St./Thompson St.) located toward the center of the module. Then, on the north (right) side of the crossing model the area up to and including the station, while on the south (left) side of the crossing model as many of the various stores and shops as space permits. If you find one too confining, it's always possible to do another. Until you need to get a trailer to hold them all. Including both the English St and Henry Clay Rd grade crossings would serve to bracket the scene on this module. My previous suggestion to also include part of the block south of English Street was based on the lack of buildings (except for the single long, narrow one) between the station/Henry Clay Inn and Henry Clay Rd - especially if this is going to be a 'one and done' project. OTOH, if you're giving consideration to constructing another module to represent the area south of English St, then that would open up more possibilities. If the leveling holes an up in the street, use manhole covers! Haha! I thought about that, too! Yes. Hell yes. If you ever head that way to do photo research, let me know. I'd tag along for the entertainment value. I like the idea of road crossing to road crossing. I think your big issue though will not be the length of the scene, as Ed K says you can always add more modules if one isn't a cure but an inspiration, but the width of the scene. 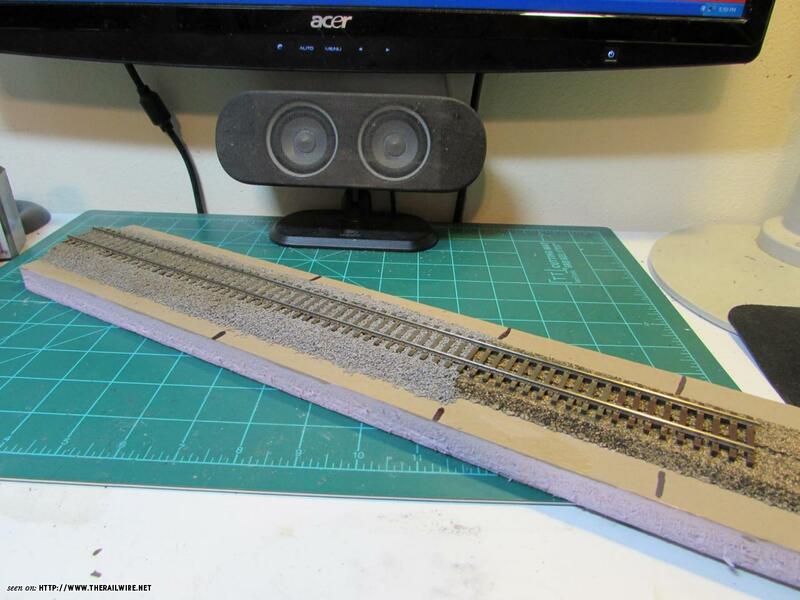 A standard width TTRAK module doesn't allow very much foreground space, so modeling anything other than the northbound lane of Railroad Ave will be tough in front of the tracks. I don't think you need much as that side of the tracks is parking lot and trees, but the trees might be right on the front edge and easily broken, as they may hinder your reach. The Richmond NTRAK club, RANTRAK is getting a TTrak layout together as some members begin building modules. They have an outstanding model of the old Richmond passenger station on a module, or did a while back, but I haven't seen any of their TTrak modules that are based on local prototypes. Here is a thought of another proto scene from Fredvegas. The old station is now a German restaurant. Expensive one, but very good. That's the overhead shot. Lots of parking lots and streets with elevated trackage, so module construction would be more complicated. Here's a street level image. 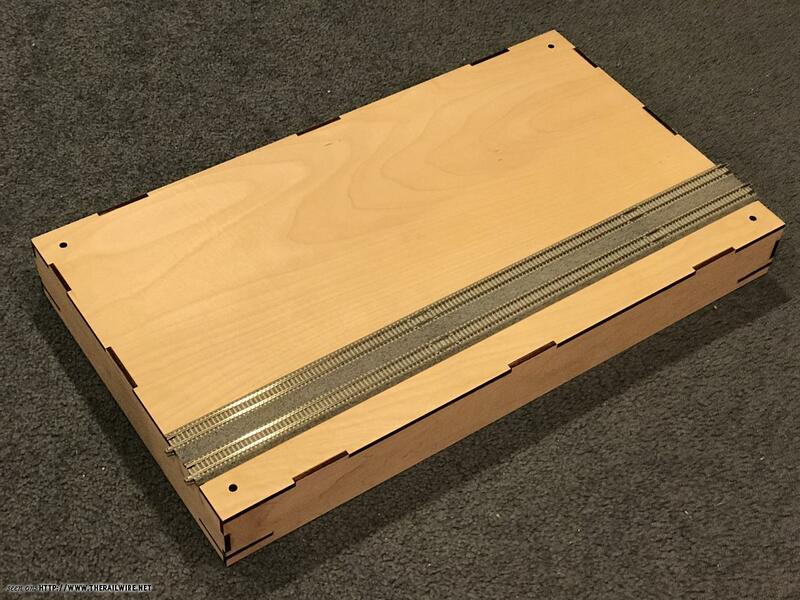 Walthers makes the overpasses easy, but a module set would need two of them. Probably a triple in length. I really don't have any interest in this point in building more modules, since I am not going to be able to get to shows very often. 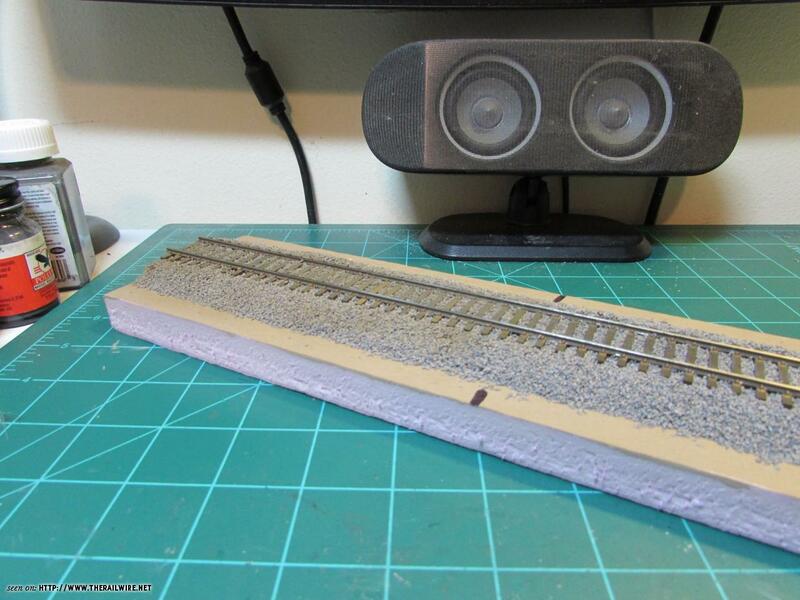 Besides, that would take hobby funds from my HO layout. 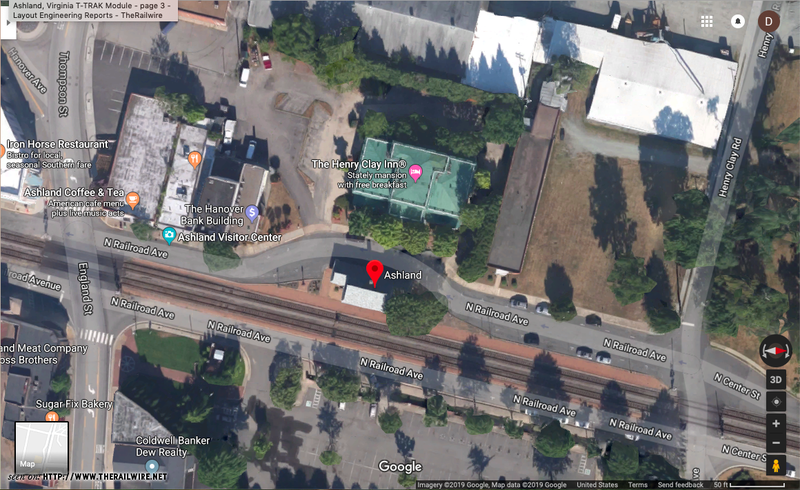 This is why I initially thought that I would model the area between English Street and Henry Clay Road, but substitute the more interesting area south of English Street for the non-descript structures just south of the station (and north of English Street). However, anyone that knows Ashland might find this obviously wrong, so I am still flirting with the idea of building that snippet between the streets as it exists in reality, taking from the open area just north of the station (and south of Henry Clay Road) for any necessary selective compression. What I need to do is lay this out on the module and see what fits. All this talk of T-trak is making me want to build a simple one for the national train show in July. I'll definitely give you a ring, if I ever head down for research. Thankfully, Google Maps is our friend, and a lot can be seen from my computer at home, not to mention my library on the RF&P. But, I have always wanted to railfan Ashland and Doswell, so . . . someday. My plan for the Ashland T-TRAK module is to only model the street, curbs, and maybe the sidewalk on the east side of the tracks. That keeps anything that could easily be damaged away from the front edge. It would be the angle you'd see if you stood on the sidewalk facing west with the buildings on the east side of the tracks behind you and the street and the tracks in front of you. Fredericksburg would make an awesome T-TRAK module. I think the track on the raised embankment and bridges wouldn't be too difficult. One would just have to cut up the T-TRAK frame a little bit. No biggie. I'll do Ashland, and you do Fredericksburg.